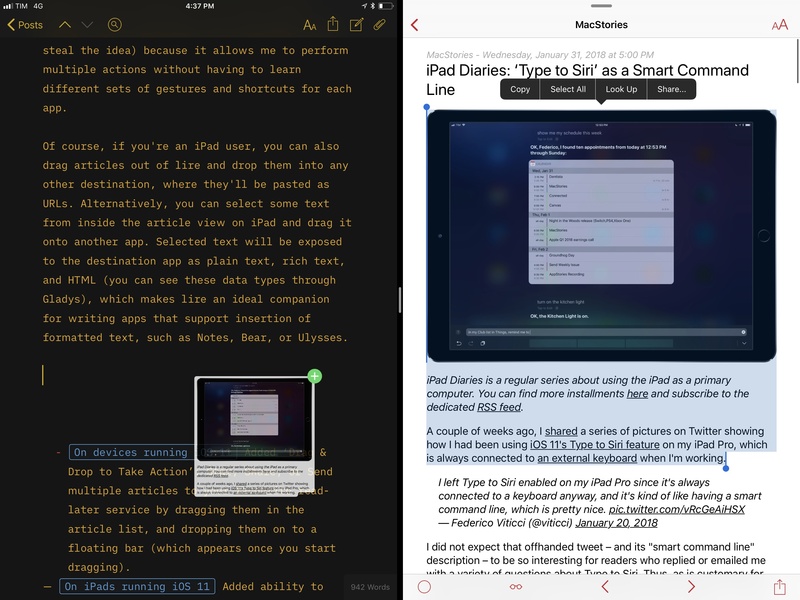 At the end of last year in my annual Must-Have Apps roundup, I covered lire, an RSS client for iPhone and iPad that, despite having been around for several years, had flown under my radar until its iOS 11 update. 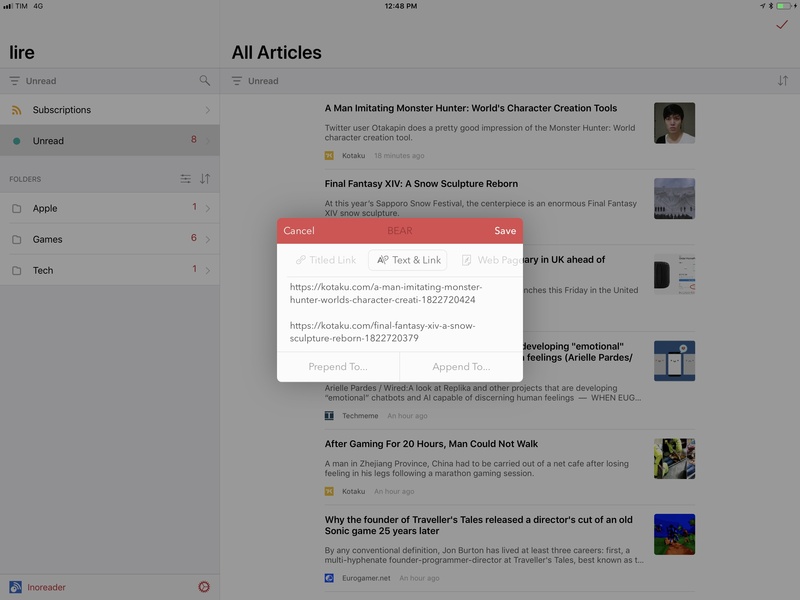 I settled on lire, an RSS reader that's been around for years and that never grabbed my attention before. lire has been fully redesigned for iOS 11, taking advantage of Apple's large title design style to neatly indicate different folders and sections. In addition to a clean design that feels good on the iPhone X and iPad Pro, lire has two peculiarities: it supports all the most popular RSS services (including Inoreader) and it comes with its own text extraction tool to load the full text of truncated stories. The full-text option can be enabled on a per-site basis, and it works well in combination with caching for read articles. lire looks native to iOS in a way that the official apps by Inoreader, NewsBlur, and Feedly don't, and it's actively supported by its developer with frequent updates. I've been using lire in combination with Inoreader since November; four months later, I still haven't found any other RSS reader that mixes iOS 11's aesthetic with support for all the most popular RSS services. Unlike other apps, lire looks native to iOS 11 and it lets you choose the sync service you prefer. Plus, the ability to load specific websites in full-text mode and a pure black theme make lire a fantastic reading experience on the iPhone X as well. 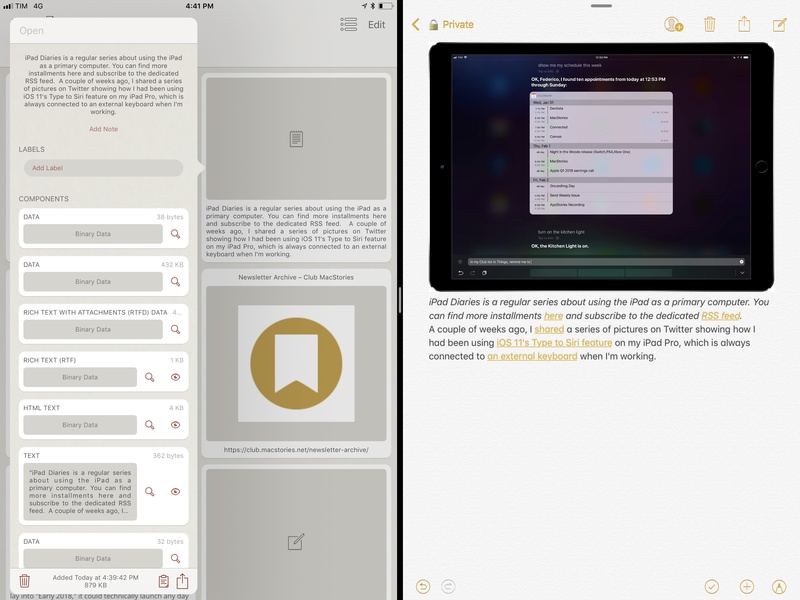 With today's 3.0.32 update, developer Kunal Sood has brought deep integration with iOS 11's drag and drop to lire, shipping one of the best implementations of the feature on both the iPhone and iPad. Which isn't surprising considering that lire's drag and drop enhancements have been directly inspired by Bear – already a terrific example of what developers can build with drag and drop in iOS 11. Just like in Shiny Frog's Bear, lire now lets you drop one or multiple articles into a floating "action bar" that only appears once you start dragging. Dropping multiple articles into the bar reveals options to star, read later, or share them at once. As with Bear's drop bar, this technique of revealing a contextual menu only during a drag operation is well suited for the iPad, but it works well on the iPhone too, simplifying operations that would otherwise require a variety of taps and swipes. In my experience (I've been using a beta version of this feature for a while now), lire's action bar has proven to be a faster way to save multiple stories from my RSS into other apps' extensions, such as the aforementioned Bear or Things. I've also found the floating bar to be useful to star multiple articles in a single action. Multiple articles shared from lire's action bar with the Bear extension. Thanks to Apple's native drag and drop framework, lire's action bar doesn't block interactions with the app: while you're holding a stack of articles, you can keep scrolling and refresh your feed list and continue using the app until you're ready to drop your drag item into the bar. I'm a fan of this functionality (and I hope that more developers steal the idea) because it allows me to perform common actions without having to learn different sets of gestures and shortcuts for each app. Of course, if you're an iPad user, you can also drag articles out of lire and drop them into any other destination, where they'll be pasted as URLs. Alternatively, you can select some text from inside the article view on iPad and drag it onto another app. Selected text will be exposed to the destination app as plain text, rich text, and HTML (you can see these data types through Gladys), which makes lire an ideal companion for writing apps that support insertion of formatted text, such as Notes, Bear, or Ulysses. When dropping a rich text selection (containing an image) from lire into Ulysses, for instance, Ulysses can see lire's rich text and intelligently convert it to Markdown with an inline image attachment. A selection from lire being dropped in Ulysses, where it'll maintain the image attachment and text styles. Lire's deep support for drag and drop and the flexibility of Apple's framework are perhaps even more impressive when using the RSS app alongside Gladys and Notes: the popular shelf app can store all the data formats available for article text clipped from lire; the latter can receive a selection from an article and retain images, formatted text, and links. Lire's article text, saved in Gladys, can be exported to Apple Notes as RTFD. 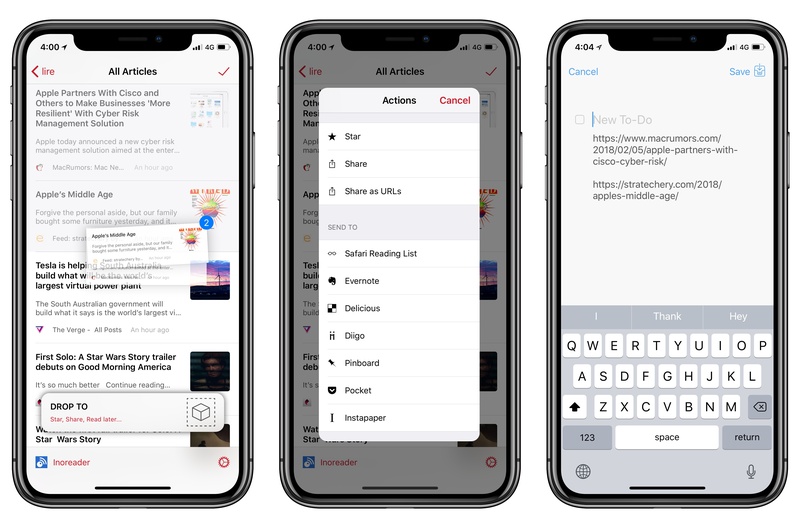 There are other noteworthy additions in lire's latest update (3D Touch is now available in article lists; there are better controls for offline article caching), but the app's fantastic integration with drag and drop is the highlight of this release. This is how I would expect all RSS readers for iOS 11 to work now: a floating bar for batch operations on selected articles, and support for exporting RTF and HTML from an article's view. Lire gets both right. I highly recommend lire if you've been looking for an RSS client that looks modern and native to iOS 11; and if you subscribe to a lot of feeds or peruse RSS as part of your daily work, I suggest you play around with lire's new drag and drop features alongside other iOS 11 apps. Lire is available on the App Store at $6.99.